The world loves bananas. Actually, the world loves the Cavendish bananas, mostly because it is (almost) the only variety commercially available worldwide. The entire global banana industry relies on this seedless and, therefore, sterile variety made of bananas all essentially identical to each other — and equally susceptible to infection by the same harmful microbes, which can spread very easily across plantations around the world. This is not a hypothetical scenario — instead, it’s happening as we speak. Photo Credit: Steve Hopson, CC BY-SA 2.5. The other species of fungi, Fusarium oxysporum f. sp.cubense (Foc), causes Panama disease. A new strain of this fungus — Foc Tropical Race 4 (Foc-TR4) — is spreading to other regions of the world. In December 2013, the journal Nature published in its News section an article on this strain “Fungus threatens top banana – Fears rise for Latin American industry as devastating disease hits leading variety in Africa and Middle East.” Foc-TR4, which was first detected in Asia in the 1990s, is found in Taiwan, Indonesia, Malaysia, the Philippines, China and northern Australia and has very recently spread to Jordan and Mozambique. One of the current solutions to the problem only adds another problem — enormous amount of fungicides are sprayed over plantations, causing serious human health concerns. As the fungi becomes resistant to them, larger and larger amounts of fungicides are needed to control the diseases. We do not seem to learn from history — the Cavendish variety was adopted by the commercial industry because it was resistant to a previous strain of Fusarium oxysporum f. sp.cubense. This strain also caused the aptly called Panama disease and in a few decades spread from Panama to other countries. By the 1960s, it had wiped out the banana variety Gros Michel, also known as Big Mike, which was grown in South America and Africa and was the dominant export banana to Europe and North America for the first half of the 1900s. Now, the Cavendish banana is succumbing to either the new Panama disease or to Black Sigatoka. I don’t think it’s possible to avoid repeating history, at least not completely, because from an economic perspective, growing one variety of bananas is more profitable. If these commercial industries find a variety that is resistant to Foc-TR4, they will start to exclusively grow this type. This may provide them with a quick solution to make profit and to avoid the use of large amounts of fungicides, but it will probably lead to another disease breakout in the future. More fungicides will be introduced, further harming human health, and eventually, another resistant variety will be chosen. It’s a continuous cycle, and unfortunately, I don’t think these industrial farms will opt out of this vicious cycle any time soon. However, there is a way out, and it’s through increasing the biodiversity of bananas, which many have suggested before me. If there were multiple varieties, the banana industry would not be as dangerously dependent on one particular type as it is now. Biodiversity will give these farmers something to fall back on when a new strain of Foc starts threatening the banana supply, and considering how infectious strains of fungi are constantly evolving, the chances of this happening is very high. 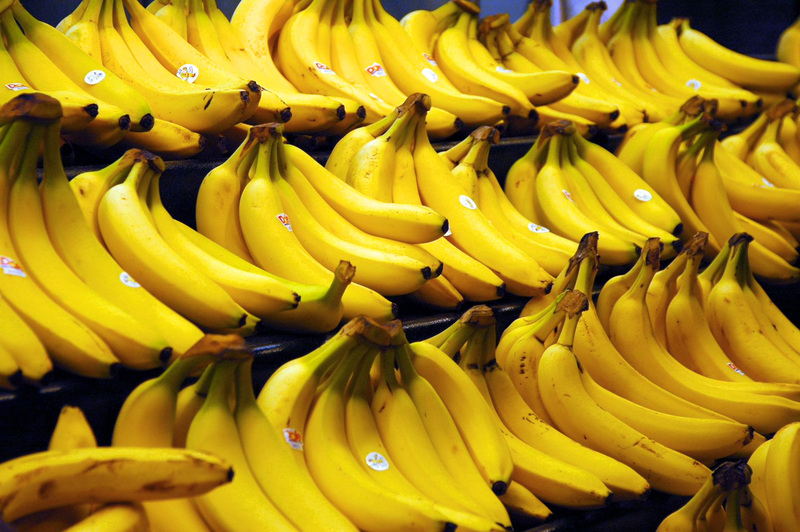 Since we can’t avoid new strains of fungi from infecting a certain variety of banana, we can limit the effects it has on the industry by removing those susceptible. It’s unlikely that a Foc strain will infect all types of bananas, so those that are not susceptible can continue to be harvested. We just need to convince these businesses that biodiversity can save them time and money in the long run. Many crops are genetically modified or selected for favorable traits. Seedless fruits are popular around the world for their convenience of consumption, which leads to higher commercial value. These seedless plants are created by genetically modifying them to induce polyploidy, which leads to sterility (1). They are then cultivated asexually. However, seedless crops have a severe disadvantage that cannot be avoided; they lack genetic diversity. In order to have these advantageous traits, they must be specifically selected for their genetic similarities. This means that a pest or pathogen that affects one genetically selected plant would be capable of affecting the rest in the crop. In the blog, it states that the current, yet unfavorable solution of to the pathogen are fungicides. However, a better way to tackle the problem is to use same method that created it: genetic modification. Fungicides may be able to be a short-term solution, but finding a way to genetically engineer the plant to be resistant to the strain would be favorable. The Nature article linked above states that scientists have already tested a transgenic specimen in field trials which were resistant to the pathogen. These resistant plants need to be introduced to the market soon, to avoid losing many fruits worldwide due to a single strain of fungus. Emshwiller, E. (2006). “Origins of polyploid crops: The example of the octaploid tuber crop Oxalis tuberosa”. In M.A. Zeder; D. Decker-Walters; E. Emshwiller; D. Bradley; B.D. Smith. Documenting domestication: new genetic and archaeological paradigms. Berkeley, USA: University of California Press. pp. 153–168. In taking biotechnology, we learn about GMO food and what type of consequence it could have in the future. Now I agree with you in that the best way to tackle such an issue is genetically modifying the crops in a way that the whole crop is not affected by a pathogen and not by use fungicides which is harmful. Although I am conflicted because I do think genetically altering crops more should not be done at all because in genetically altering crops antibiotic gene are inserted into these GM crops in which we eat. This could consequently lead to our immune system becoming more antibiotic resistant or our intestinal bacteria turning into a pesticide factory. I wonder if there is any other way to solve this problem without there being any harm or future consequence to our health? I actually first read about this while taking AP environmental science in high school. It’s another scary topic that is generally ignored by the mainstream media. Honestly, I am somewhat surprised that this is still a concern considering the threat of Black Sigatoka has existed for many years now. It seems painstakingly obvious to me that exclusively producing this one strain of Cavendish banana has high potential risk to infection of any kind be it fungal or viral. Growing one specific strain reduces genetic variability, which is at the heart of immunity weather it concerns bananas or humans. Imagine if humans only had one set of HLA genes, our immune system wouldn’t be anywhere nearly as effective as it is. That is basically what is going on with the world population of bananas. This one strand is predominant so all it takes is one fungus to have a global impact. All this being said I do take a little bit of pleasure in the fact that the industrial farms are at the greatest risk. Industrial farming is greatest threat to biodiversity and one of the biggest contributors to environmental degradation through deforestation and careless pesticide use. They should have seen this coming. The reassuring side is that “most of the bananas important for the food supply are grown by smallholder farmers in low-income countries and consumed locally.” So maybe this will have some positive outcomes, such as articles like this making it into the mainstream media to raise awareness of the value of biodiversity and the threat that industrial farms pose to it. It could also prompt industrial farms to reevaluate the use of different strains of the crops that they grow, not only in the banana industry but other crops as well.